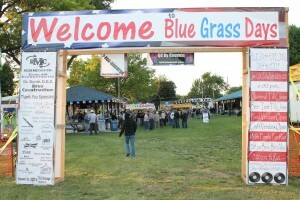 Park preparation for Blue Grass Days Volunteers needed on Friday June 7th at 10:00 am. Please come and help. 5:00 pm – 12:00 am: Beverage Pavilion – Sponsored by Rich Metals Co.
6:00 pm: 1 Mile Fun Run – Sponsored by – Davenport Electric Contract Co. (DECCO) Contact Brinson or Donna Kinzer at 563-381-7686 Awards following 5K Run/Walk inside Blue Grass Community Club, 232 E. Orphed St.
7:00 pm: 5K Run/Walk - Sponsored by – Davenport Electric Contract Co. (DECCO) = Contact Brinson or Donna Kinzer at 563-381-7686. Awards following inside Blue Grass Community Club, 232 E. Orphed St.
6:30 am – 10:00 am: Breakfast – Blue Grass American Legion, 106 S. Juniata St.
12:00 pm – 12:00 am: Beverage Pavilion – Sponsored by = Rich Metals Co.
1:00 pm: At large pavilion, drop-off time for Strawberry Rhubarb Pie Baking Contest - Sponsored by = TBA; Pie Contest flyer available inside Blue Grass Savings Bank or download flyer here STRAWBERRY RHUBARB PIE BAKING CONTEST Contact Tina at 563-343-2004. 5:45 pm: Pie Auction - Sponsored by = TBA Live Pie Auction at Center Stage.